Clemson Football Game Program Feature: Ready For Moore? For Rennie Moore, there are three seasons…football, hunting, and fishing. On weekends when Moore is not suited up for the Tigers, you can often find him back home in south Georgia in the woods or on the lake fishing with his father. Moore was born in Germany and moved to southern Georgia as a child. Growing up in Georgia, especially Camden County, sports was a way of life. Almost every child played a sport, and Moore was no different. He excelled not only on the football field, but also on the baseball diamond and basketball court. As Moore grew older, he knew his future was on the gridiron. As a highly-sought-after defensive end and tight end prospect, Moore flourished in high school, garnering the attention of a variety of schools, including Florida, Florida State, and Georgia. He was a member of a state championship team as a freshman, won four consecutive region titles, and set the state record with 58 straight wins. As far as personal accomplishments, those were in abundance for Moore, who was named all-region, All-Southeast Georgia, and all-state as a senior. Moore was also selected for and participated in the Georgia North-South All-Star Game. Moore brought his excitement of the game of football to Tigertown. This excitement has been noticed by not only the fans, but also the coaches during his career. In a recent interview, he was asked about playing with so much energy and how that helps drive him during the game. When he arrived on campus in 2007, he was thrown into the fire immediately at defensive end following the departure of the late Gaines Adams to the NFL. The 2007 season saw Moore appear in six games as a first-year freshman, including a season-high 10 snaps in a victory at Duke. Following the 2007 season, Moore red-shirted in 2008 in order to work on his strength and technique so he could make the move from a pass-rushing defensive end to a defensive tackle that could stop the run. It also added a valuable dimension to Clemson’s pass rush from his new position. The 2009 season saw Moore make an immediate impact, as he had 22 tackles in 198 snaps. His best game was one that saw the Tigers clinch the ACC Atlantic Division crown. 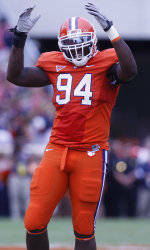 He totaled two sacks in a victory over Virginia in Death Valley that gave Clemson its sixth ACC win. Moore was a valuable member of a defense that was 20th in the nation in total defense. In 2010, Moore had his best season to date. He appeared in all 13 games, including a start against Presbyterian College in the place of injured All-ACC defensive tackle Jarvis Jenkins. His seven tackles for loss were the most by any non-regular starter and fifth-most overall on a defense that placed six members on NFL teams in 2011. His best game of the season came in a 14-13 Tiger victory over N.C. State that saw him total three tackles, including two tackles for loss and a sack. Clemson finished the year in the top 25 in scoring defense and total defense, the second straight year the Tigers could make that claim with Moore in the lineup. The 2011 season presents a new challenge for Moore. He has been asked to fill the role as the starting defensive tackle vacated by Jenkins. Moore was immediately up to the challenge, working hard during spring practice to improve not only his strength, but also his technique in order to be successful as an “undersized” defensive tackle at 265 pounds. “Rennie has worked hard physically,” added Defensive Tackles Coach Dan Brooks. “He’s a solid 265 pounds and has continued to buy in as we’ve told him what we need him to do for us this year. The Tigers are well on their way to accomplishing those goals thanks in large part to the efforts of Moore. As his Clemson career comes to an end this season, for Moore, one aspect on gamedays in Death Valley that he cherises is something that is near and dear to him. As charismatic of a person that Moore is, it is no surprise to hear that after football, he has some lofty goals.